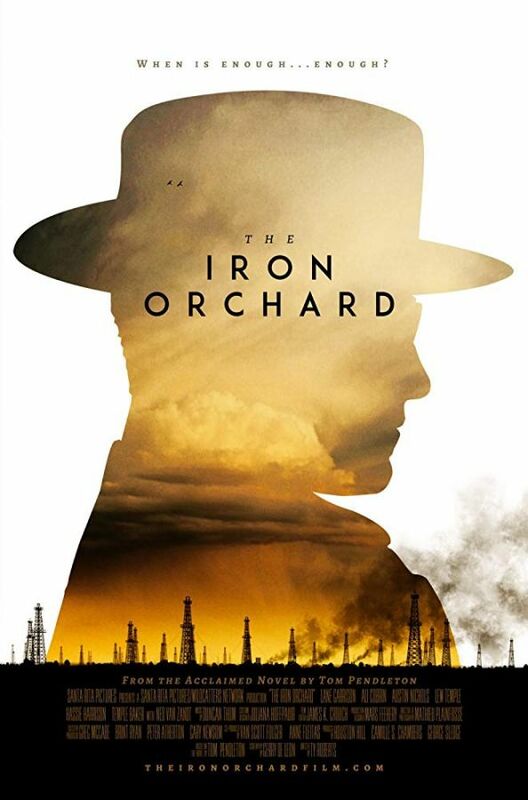 The Iron Orchard is the story of Jim McNeely (Lane Garrison), a young man thrust into the vibrant and brutal West Texas oilfields in 1939. In a state gushing with oil and filled with ambition, McNeely settles into a small-town community that is slowly overcoming the trauma of the Great Depression. The formidable path before him is riddled with obstacles – overbearing bosses who try to keep him down, powerful oilmen who are reluctant to invest in a fresh face, and women who see salvation in his charms – but he finds a glimmer of hope with his first loves: new wife Lee Montgomery (Ali Cobrin) and drilling for oil. With everything falling into place to ascend to the top of the oil chain, McNeely stumbles upwards through his success and in turn jeopardizes his desperate longing to conquer this brave new world of influence and wealth. What will define his legacy in building the rich oil tradition of West Texas? Based on Tom Pendleton’s 1966 salacious novel of the same name that defined generations of Texans to follow, The Iron Orchard harkens back to a time of unfulfilled dreams and tarnished spirits that would either break men unworthy of admiration or shower them with riches that could corrupt even the most righteous of us all.